In the video below, we discuss how to successfully plan client meetings with the use of AI. Whether a wholesaler is meeting with a client in one of your offices or out on the road, they need an efficient way to prepare ahead of time. They also need to be able to plan the meeting itself, as well as take down notes regarding actionable items during the meeting. Check out this video to learn more about how machine learning and AI can streamline this process, increasing both the effectiveness and efficiency of your wholesalers’ client meetings -- both in the office and out on the road. When wholesalers meet with prospects or existing clients -- whether it’s in the office or out on the road -- they need the right tools to plan and coordinate these meetings ahead of time with the right people. Without the right agenda and materials, a meeting is bound to underdeliver. But, of course, meetings are about more than just planning. It’s also important to record relevant information during a meeting, particularly actionable items. Without the right action items, a meeting can feel like a waste of time and resources. More often than not, organizations use software solutions such as Outlook or Excel to track and record information from meetings. Occasionally, organizations will also rely on CRM solutions as well, such as Microsoft Dynamics CRM. Thanks to the power of machine learning and AI, client and prospect meetings can result in even better outcomes. Not only can AI increase effectiveness when planning and coordinating meetings, but it can also assist with information capture during a meeting--freeing up the wholesaler to do what they do best: focus on the prospect or client. Think AI is a tool of the distant future? Think again. The power of AI can be harnessed by your business right now. With the AI features in software solutions like Microsoft Dynamics 365 CRM, you’ll be able to maximize both your and your clients’ time. Take a look at this video to learn more about how AI and machine learning can work for your business, and keep an eye out for future videos. 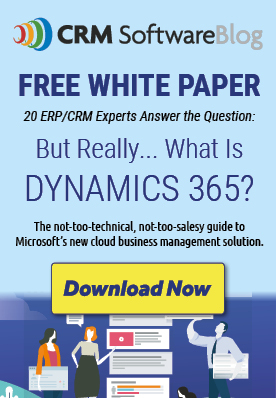 Dynamics CRM 2015 for Manufacturers – What’s in it for You?